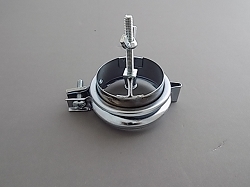 Adjustable carburetor made to fit US standard 1bbl manifold bolt patterns. These high quality NEW carburetors feature a fully adjustable external high speed main jet, along with adjustable throttle levers, so you can quickly change the high speed jetting and throttle arm setup. 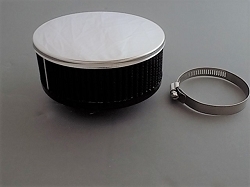 Ideal for fine tuning any application for fuel/air mixture on the high speed circuit, especially when using the carburetors on dual or triple carb installations. 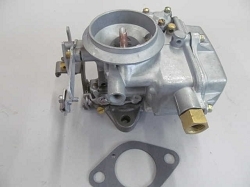 This carburetor has been built since 1957, originally for Ford, and have been modified through the years in order to fit a wider range of vehicles. Works with Ford Load-O-Matic distributors. Can also be used to replace a Holley 1940, Autolite 1100 and Rochester B carburetors, but may need some re-routing of vacuum and fuel lines. Autolite 1100 - Watch a video. Carter BBS - will replace but these are manual choke and most BBS are automatic choke, so a choke cable would have to be installed. Carter B&B - will work on this one depending on your mechanical ability. You will have to re-route the fuel line. Carter RBS - Watch a video. Rochester Monojet - Can replace the automatic choke type, but you will have to convert to manual choke by adding a choke cable. For the Mopar slant 6, 1961-1966, we have a different replacement carburetor. Banjo type inlet - also comes with the standard 1904 fuel inlet so the banjo may not be needed. Bolt holes are elongated so it will adapt to mounts that are 2 3/4", 2 15/16", or 3". We have carburetor kits for this carburetor. UNIVERSAL carburetors are manufactured to the highest quality standards, and contain alcohol resistant parts thru out, for long service life, under normal operating conditions. 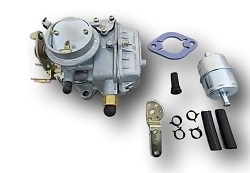 Our fully UNIVERSAL carburetors are especially made to allow a wider variety of external adjustments. They have fully adjustable throttle arms, and externally adjustable high speed main jets. This allows the throttle arm to be indexed to any point you may need the arm to move. The externally adjustable main jet allows you to fine tune the high speed rich/lean mixture to the exact demands of your current engine. Variations in fuel lines, vacuum lines, choke cables and air cleaners may require re-routing or adapting of those items. Variations are usually not a problem on standard 1904 carburetors. 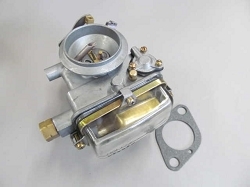 Your DAYTONA UNIVERSAL CARBURETOR is manufactured to the highest quality standards, and are warranted, to be free from defects in both workmanship and material for a period of (1) year from the date of purchase, provided that the product is properly installed, subjected to normal use and service and that the product is not modified or changed in any way, nor damaged because of negligence by customer or installer or used for racing or competition purposes. If you believe that you have a defective product, it must be returned, freight prepaid, directly to Daytona Parts Company LLC, along with Proof of purchase and a complete description of the problem. If a thorough inspection of the product by the factory indicates defects in workmanship or material, our sole obligation shall be to repair or replace the product. Warranty covers only the product itself and not the cost of Installation or removal. Warranty is void under the following conditions. 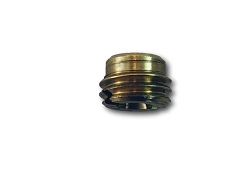 Enclosed fuel filter is not installed; dirt or rust enters the carburetor for any reason; if carburetor disassembly is attempted by either purchaser or third party; incorrect usage of aftermarket gasoline additives or long periods of inactivity resulting in varnish buildup inside the carburetor; Any usage of gasoline alcohol content over 10%; Stripped screws, inlet threads, bent or broken levers or castings are not normal warranty issues, but an indication of misuse by the purchaser or third parties. 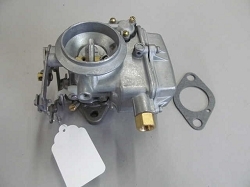 Due to the nature of replacement or performance applications, the parts or carburetors are sold without any expressed warranty or any implied warranty of merchantability or fitness for a particular purpose. Daytona Parts Company LLC shall not, under any circumstances, be liable for any special, incidental, or consequential damages, including, but not limited to, damage or loss of property or equipment, loss of profits or revenue, cost of purchased or replaced goods, or claims of customers of the purchaser, which may arise and/or result from the sale, installation or use of these parts. Check with your State vehicle emission regulating authorities before installation of any parts or carburetors. Daytona Parts Company LLC, is not liable for your vehicles emission law compliance, or for the failure of an emissions test or inspection. now i´ve installed this new carb on our 200cui. mustang´65,and i am very surprised about the relative good idle with a small adjustment job. becouse the weather isn`t very good,so,for street-tests i have to wait.... the carb is easy to install,and i think it is a good quality! This 1904 carb brought new life to my 47 Dodge which was running a BBS carb. Noticeably increase in power and no flooding after engine was shut of. Eliminated the smell of gas in the garage! And it looks great.! 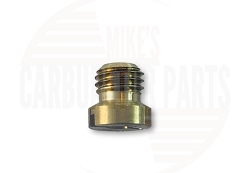 This carb was purchased for a Cat V40B forklift. Caterpillar told me there were no parts available. The local carb shop would not rebuild my carb because the carb body was warped. This universal carb fit perfectly and restored our lift to operating condition. Arrived with all the required parts - installed easily - followed the enclosed instructions to adjust the linkage and mixture - my 235 runs great! Great service/response both on the internet and the phone. It is so nice to do business with people who know what they are doing and enjoy being in business. I almost wish I had more gas engines to service. This carb replaced a single barrel Carter/Motorcraft on a Ford 4x4 with a 4.9L inline six. The only adjustments needed upon installation were the idle mixture (rich from factory), and the idle speed. This was as simple of an install and adjust as it gets with a carb. Very happy with the product. Fuel delivery was smooth. No flat spots due to lean or rich conditions experienced throughout normal operating RPM. This is replacing a worn out Rochester that was prone to running rich and flooding. Installation took a bit of fiddling to get the linkage lined up and adjusted, and my original manual choke cable assembly needed to be replaced; but once that was done, the truck fired right up. With some adjusting of the high and low speed jets, the truck will now idle smoothly and has plenty of power on hills and on the highway. 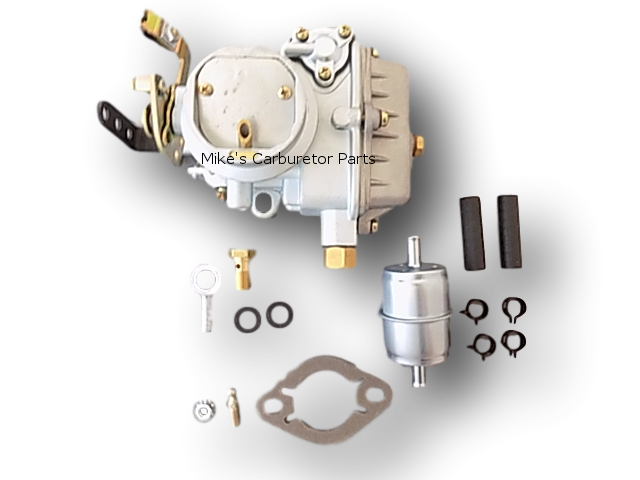 We purchased this carburetor for a wire pulling machine that has a 300 Ford Industrial engine. The carburetor was simple to adapt to work with all the original controls & is performing well. It looks like this carburetor will do the job we need until we update the machine to a modern diesel engine. The carb was put on a Old forklift that had basically the same carb on it from looking on the outside. It bolted on great and all linkages and hose connections worked great. BUT that is where it stopped the inside throat is over a inch bigger then the old one and the engine has a VERY bad bogging condition like the Acc. pump is out but it is not. The only way to make engine run is restrict the air intake over half then it runs perfect. No matter what we adjust or try, the bog stayed till we tapped over the air intake. It is still better then the old carb. I am not blaming the carb--it is just the wrong size for the engine. It is still a great carb. Q: Will this carb work as is on my 1965 Ford 300 MT? Q: can this carb. replace my 1940 carb ? Q: What cfm are the carburetors and would they be sufficient to run in a multicarb set up on a .30 over 250 with two carb intake with an upgraded hot street cam? Q: Will this fit a 1960 International Metro van with a 264? Q: 1904 carb. It leaking accelerator pump stoke ?do I have to rebuild the hole carb. Q: I have a leaking 1904 on my 1952 Ford F1 (215 6cyl). Will this universal carburetor work and how much adjusting will/should I need to do in order to get the truck to run without leaking gas all over the manifold? Holley 1904 Rebuilt Carburetor I.H.C.